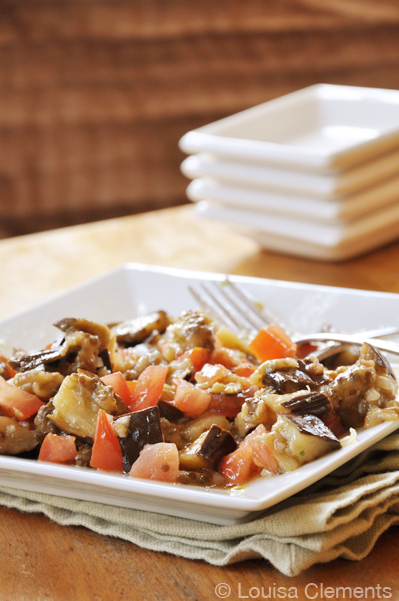 Today, I’m sharing a recipe for a somewhat, purple dish: Eggplant Salad. It is an easy meatless, and vegan dish that is perfect to bring to a potluck. Fresh tasting, it goes well on its own or served on a piece of toast as a little crostini type dish. It’s got a little bit of a Mediterranean flare, and makes a super healthy and easy appetizer or side dish. On a baking dish, bake eggplant for an hour. Allow to cool and cut into bite sized pieces. Add tomato, onion and garlic to bowl. Add in the eggplant. Toss with olive oil, lemon juice, vinegar and parsley. I hope you enjoy this Eggplant Salad.